The website for Dr. Hebert Lamblet, a cosmetic plastic surgeon in Rio de Janeiro, is designed to be a comprehensive overview of Dr. Lamblet’s practice while catering to both local and global audiences. Dr. Lamblet’s new site incorporates content optimized for search engines, an updated blog, a virtual consultation capability (including consultations via the Skype network), a patient before-and-after photo gallery, and detailed descriptions of the many procedures he offers. 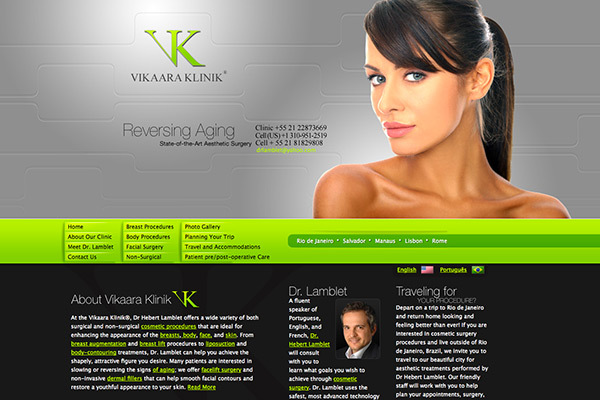 There is also a Traveling Patients page and a Trip Planner with information geared specifically toward those who are visiting Dr. Lamblet’s Vikaara Klinik from other regions around the world. The site contains airline information, seasonal and holiday details for those new to Brazil, and a trip planner with an array of tips and advice for travelers – all in an easy-to-navigate site with a streamlined, uncluttered aesthetic.